The Sunday after next will be the last Sunday after Pentecost, the end of the Church's year. And knowing that we must soon read about the events at the end of the world, the Church takes this opportunity to give us a very brief summary of the doctrines of our salvation. Paul alludes to the resurrection, and the glorified bodies that we will receive in return for our persistence: “He will reform the body of our lowness, made like to the body of His glory.” But there is also a hint in his words that bringing ourselves under self discipline will be its own reward, that we, like Christ, will then be able to subdue the things around us; that we will then be able to use the things of the earth to achieve a heavenly purpose. Yet, this Mass is clearly a reminder of the Resurrection. We see this in the Gospel, as our Lord raises a young girl, recently deceased, to life. And, again, as we begin to approach the end of the liturgical year, and begin to think of the end of the world, we are reminded that at the general judgment we will be restored to perfect bodies. Yet, even in this, there is an element of warning, for that perfect body of ours can either be a perfect instrument for enjoying the pleasures of heaven—or a perfect instrument for suffering the torments of hell. The ruler portrayed in the Gospel, whom Mark and Luke  identify as Jairus, an important man in the synagogue, fell down at the feet of Jesus and adored him—something that would have been blasphemy for a religious Jew, if he were not certain that Jesus was the Son of God. This man Jairus reminds us that we are obligated to worship God, to adore Him, at least as often as we petition God, asking Him for the good things we need an want. Jairus reminds us of our obligation to worship God alone; to worship Him through the Holy Sacrifice of the Mass which God Himself has given to us as the way in which He wants to be worshipped. We also see in this man, Jairus, a reminder to place our affairs in the hands of God. We can, and should, do what we are able to look after our needs, and the needs of our loved ones. Our Catholic Faith encourages us to personal responsibility and personal charity. But everything we do should be done with prayer, placing our trust in God, who will grant us those things which are truly beneficial for us, in conformity with His divine providence. Jairus also reminds us to pray for the dead. This is why we placed so much emphasis on All Souls day, and actually calling to mind and writing down the names of those for whom we should pray. Certainly, it is unlikely that we will bring about their resurrection any time before the General Judgment. But we do know that such prayer is capable of mitigating the punishments due to sin, or perhaps, liberating them from Purgatory all together. We know, too, that the souls in purgatory are saints, who will some day reign in heaven—that they will pray for us, as we have prayed for them. 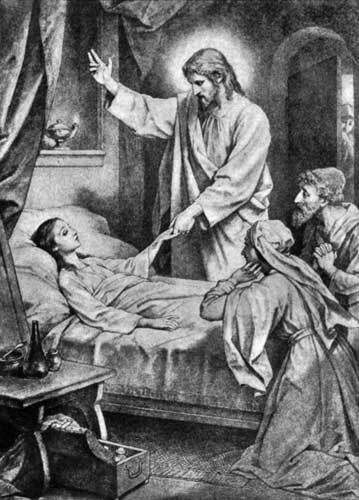 Finally, there is the woman who came to be healed just as Jesus was about to go with the father of the little girl. This woman reminds us of the need for humility and trust. She didn't even think of herself as being worthy to ask Jesus for a cure. She knew that she was no one of importance. Yet she also knew that she didn't have to do anything more than touch the hem of Jesus' garment to start the wheels of divine providence in motion. If we are likewise humble, we will be granted a great share in the virtue of hope—knowing that God is able and willing to provide all that is necessary for our salvation. The Old Testament refers to a certain pagan Syrian, Naaman, a general of their army, who was sent to the Prophet Eliseus to be healed of his leprosy. At first he was prideful, refusing the Prophet’s instruction to merely to go and wash in the Jordan River in order to receive his cure. He seemed to think that the rivers of his native Damascus were far better than the puny Jordan River of Israel. But a little girl convinced him of the need for humility, and he washed in the Jordan, and was cured, and he was converted from his paganism to the worship of the Living God. Nowhere in the Scriptures have I been able to find pride-filled, boasting people cured from their illness, or strengthened in their Faith. We can be no different. We are close to the end of the Church's year. We are also one year closer to our own eternity than we were when we last celebrated this twenty-third Sunday after Pentecost. In two Sundays, God willing, we will be asked to think about the end of time, and about our own personal end. This Sunday we begin to prepare for the rest of our life—hopefully, ordering it as outlined in the readings of this Mass—with an emphasis on spiritual things rather than those of the earth; with self discipline rather than indulgence; giving worship to God in the way He asks; trusting in His mercy to provide what is beneficial; praying for those who have gone before us and for those around us; praying with humility and hope. We are offered a choice between a glorious resurrection to the life of heaven, or an eternity of shame and suffering. Relatively soon, that choice will become irrevocable—for the end of the world will come for each and every one of us in a personal way.